Th Van Landingham Glen was the first installment of UNC Charlotte’s Botanical Gardens. Dr. Heck used the Glen as a living classroom where students could study Botany. This was also the site where the local Rhododendron Society would meet and grow both native and hybrid rhododendrons. The Glen is also the final resting place of UNC Charlotte’s beloved Bonnie E. Cone, who supported and cherished the botanical gardens. 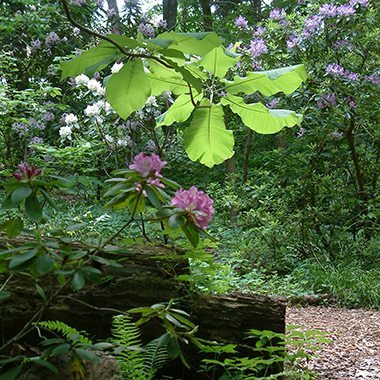 The Van Landingham Glen is a woodland garden that may remind some visitors of mountains. With its hemlock and many other native plants, this quiet space recreates some of the Carolina’s portion of the Appalachian Mountains. The Needle Palm, a guest favorite, is a non-trunking tree that looks like a shrub. It has long hard needles that First Nation Americans used to create jewelry. 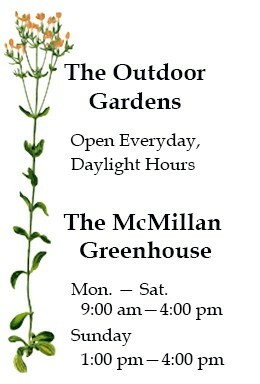 The Glen also features wildflowers unlike any other Charlotte garden. These wildflowers are native spring ephemerals. They are extremely short lived, emerging before anything else has bloomed and falling as leaves take their place. Among other beautiful wildflowers, the Glen becomes carpeted in Bloodroot in the Spring. 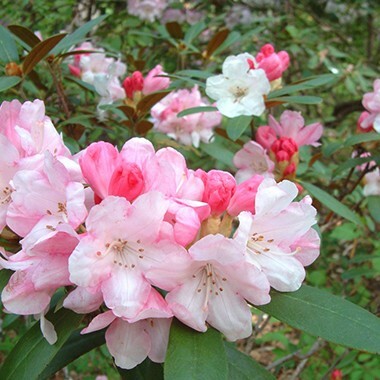 Thanks to the Rhododendron Society that previously met and worked in this garden, the rhododendrons of the Van Landingham Glen include a large variety. The hybrid rhododendrons are the only non-native plants in this garden. You can enjoy these wonderful plants by walking the trails, and by sitting by Bonnie E. Cone’s resting place. The entirety of the Van Landingham Glen is a peaceful and quiet respite from the busy university life around it, but Bonnie E. Cone’s space is especially tranquil and offers guests an opportunity to rest and reflect.